Widely tolerant. Any soil that does not remain soggy. Easy. Divide every 2 to 3 years to maintain vigor. Excellent butterfly plant. Liatris is a striking plant and a definite must for those who enjoy cut flowers. Spicata grows to three feet tall and has handsome, rosy-purple spikes in midsummer. Unlike most spiked flowers, florets open from the top down on the spike. They are a good choice for the back of the border and a nice complement to yellow and white daisy-type flowers. There are wild forms of liatris that are native to Minnesota prairies. Thus, most varieties are well-adapted to our area. 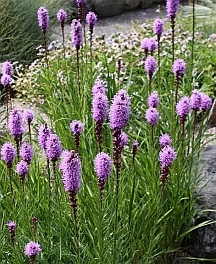 Liatris prefers full sun or a very light shade. Well-drained soil is important - soggy conditions can be fatal over the winter. Space plants 12 to 15 inches apart. They should be divided every 3 or 4 years when they begin to crowd. The corms get very woody. To the extent possible, try to break them apart without exposing a lot of flesh. If this doesn't work, a strong knife should do the trick. They are best divided in the early spring just as new shoots begin to appear.